A swimming pool can be a fantastic addition to your yard. To be able to walk outside and cool off in your pool on a hot day, or sit pool-side and read or relax is truly a luxury. Some homeowners may dream of adding a pool to their yard, but fear that their yard is too sloped, or too small, or that the soil would make construction difficult. We've written about how to design and build swimming pools that accommodate yard slopes, and about different soil types in Arkansas that can make construction more complicated, and how experienced pool builders can construct a pool amid less than ideal soil conditions so that no issues arise down the road. But, what about small yards? If you have a petite yard is a swimming pool out of the questions? Not necessarily. 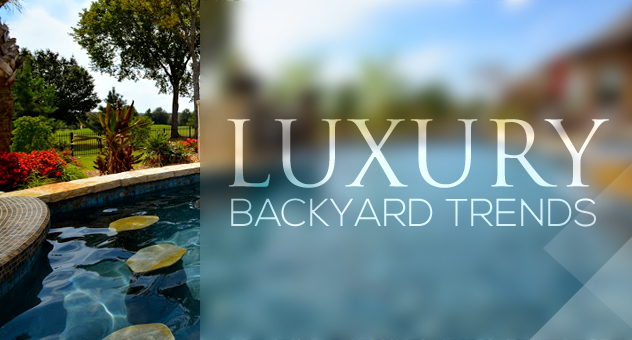 While it's true that a small yard cannot usually accommodate a large pool or a diving pool, that doesn't exclude you from having your own backyard escape. Before gunite (concrete) pools, you were more limited to the sizes and shapes that liner and fiberglass pools were available or commonly made in. If they didn't fit your yard you were just out of luck. Unlike pre-designed liner and fiberglass pools, gunite pools are completely customizable and offers almost unlimited options. These pools can be easily designed to fit even small yards, or a small portion of your yard so the rest can be used for other purposes. They can also have several built-in features added to them like benches, swim-up bars and bar stools, spas and waterfalls. You may be wondering if a pool that fits your small yard will also fit a smaller budget. A pool half the size of a larger pool will not necessarily be half the price of that pool. You will save on some of the materials because less of them will be needed, but things like the pool equipment (pump, heater, lighting, filtration system, etc. ), the cost of getting the excavation and construction equipment to the site, and the labor cost will not greatly vary. If you think a small swimming pool might be a good option for your yard, give us a call and we'll be happy to take a look at it with you. Having a beautiful custom in-ground swimming pool in your backyard is a lot like having your own personal resort. Unlike an actual resort though, you're responsible for making sure your pool stays looking pristine. What if your pool could clean itself? Most pools have skimming systems that do a good job of keeping the surface of the pool clean. These systems involve jets around the top of the pool that push debris into the skimmers and is then filtered out, but debris also falls to the bottom and accumulates. These stagnant areas of the pool are prone to algae build up as well. In-floor cleaning systems target the areas that skimmers miss. These systems deliver automated, silent, and systematic programmed cleaning. With in-floor systems, cleaning heads are installed in the pool floor, steps and benches. These cleaning heads remain flush with the floor until water is directed through them for cleaning. During cleaning the heads pop-up and direct filtered, treated water across the floor and walls of the pool. This stirs up any dirt and debris so that it's suspended and can be removed by the pools filtration system. The system rotates 360 degrees through each set of heads (zones) about every 60 seconds and cleans the entire pool in about an hour. This proper circulation keeps the pool clean and healthy and evenly distributes sanitized, and filtered water throughout the entire pool. This helps eliminate "dead spots" that can cause algae growth. If you have a heated pool, this extra circulation and distribution can also make your heater more effective and help eliminate cold layering. Each system is customized by the manufactuer for the pool it's being installed in. The number and placement of the cleaning heads will be specific to the shape and size of the pool so that every area stay well circulated and clean. Because this system is "built in" it's virtually invisible. There are no unsightly robots or hoses. But, most importantly, it keeps the pool clean on it's own so you don't have to. Anytime your filter pump is running, the pool is being cleaned internally. When you are planning your pool, this is technology you may choose to visit. We have a set up in our office to demonstrate the effectivness of the entire cleaning system. Cleaning systems are often overlooked in the marketplace. Check with your designer to make sure you have the proper cleaning system based on environmental factors and other requirements so your pool can be enjoyed and not become a maintenance issue. Are you thinking about adding a fun feature to your pool but looking for an alternative to a water slide or diving board? 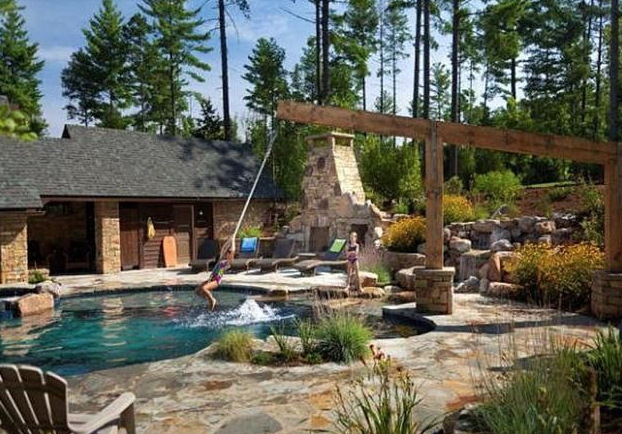 We're noticing a growing trend in customers wanting to add rope swings to their swimming pool design. This can be a unique feature that makes your pool extra special. In order for a pool rope swing to function and be safe, it has to be suspended from an apparatus that extends out over the deepest part of the swimming pool. Here are a couple ways we have seen this done. One way way is to extend a large wooden beam over the pool like in the photo shown here. The wooden beam pairs well with the natural style of the swimming pool and the stone work encasing the base of the pillars helps blend it into the environment. For a more modern style pool a metal beam could be substituted for the wood and the base could be encased in materials that work with the swimming pools finish. This swing uses an elaborate arch design that matches the Mediterranean style of the swimming pool. This type of design doesn't jut out over the water as much as a beam. It can be as simple or extravagant as desired and tailored to match any pool. This particular pool features a raised platform, but a more simple design can be level with the pool, or only slightly raised. One of the recurring themes we've seen is like the one in this photo. 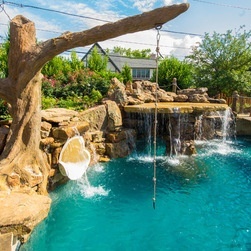 These pools take the natural setting to the extreme by incorporating rock waterfalls and grottos, and gunite trees that function as the swing structure. These "trees" are made out of steel beams and mesh that is coated in gunite and finished to look like a tree. This type of design is very unique, and thus only works for a particular style of backyard design. Swimming pool rope swings are not necessarily a less expensive option than a diving board or slide. However, they are a fun alternative and one could be designed to work within your budget. At Parrot Bay Pools we have several more ideas when it comes to installing these swings and working them into your swimming pool design. Summer is fading and it is actually beginning to feel more like fall. Less thoughts are on swimming pools and barbeques, and anticipation for the holidays and cooler weather are setting in. For the serious pool planner though, the one hoping to have their pool finished in time for next summer, you might need to keep thinking about that dream backyard a little longer instead of putting it off until spring. 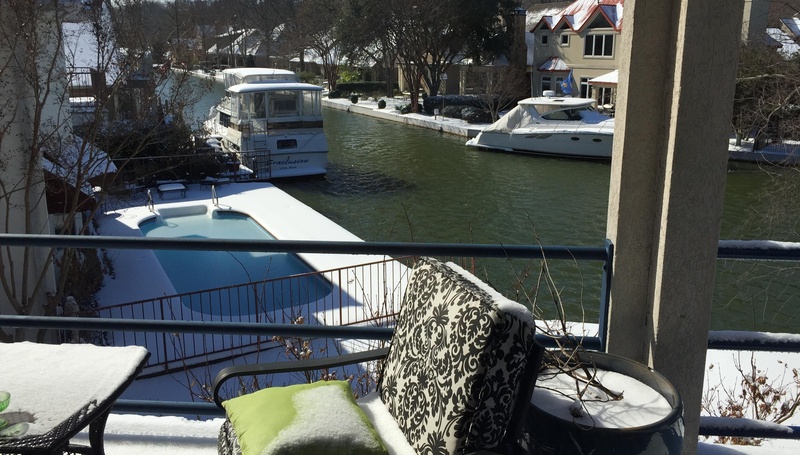 Because of the relentless snow/icy and rainy weather this past spring, many swimming pool company's scheduled projects have been pushed back by some 3 - 5 months. Rain damage can set a project back significantly, like the pools in the photos below from last spring. While most projects take about 8-12 weeks to finish, the time before your project can be started will vary a lot based on the time of year and how many projects the pool builder has in their "queue". Most reputable pool companies have several projects scheduled at any given time. Because of the challenging spring we had this year, project "start times" may be farther out than you think. So for YOU, the serious pool planner, what does all this mean? If you’re goal is to have a sparkling new pool up and running by summer 2016, contact your short list or potential swimming pool contractors sooner rather than later. Find out from each when you’re project would begin, what the estimated time to completion would be based on the scope of the project, and what potential delays could arise based on the season it would be under construction. Once you have this information you’ll be better prepared to make a decision on when to initiate a contract, break ground, and get your dream backyard project underway. With this being said, don't delay your project any longer if it is still on your plate to do. Schedule meetings with your chosen pool companies and move toward placing your project on a companies schedule board. Enjoy this nice fall-like weather. Off Season Swimming Pool Specials? I often get asked about fall or winter specials. Are swimming pools cheaper in the off season? Here is the crux of the matter. Most off season “promotions” by pool companies are basically a marketing ploy in order to capture your business. Here at Parrot Bay Pools, we recommend you get two or three proposals for your backyard project, then evaluate the costs based on the design / shape and features provided to you by the companies. Assess what’s offered by all considered and make an informed decision with all the facts regarding your potential project. What you don’t want to see are corners being cut in order to reduce the pricing just to land your business. Swimming pool construction, being an out-door building process, generally costs companies more to construct in the winter or off-season months than they do in the warm summer months. Why is this? Well, day light hours in the winter are shorter, reducing the number hours that can be worked in a day. Soil conditions stays wetter due to lower temperatures. Colder weather prohibits some parts of the process, i.e. plumbing pipe, pouring concrete, etc. Water tables rise which can cause excavation issues during the digging of your pool. These weather delays extend the construction process thereby costing companies more money and time to construct your pool project in the long run. Labor and material cost do not drop in the colder months either. At best, company margins may decrease somewhat due to the climatic conditions that may prevail. Do companies have a minimal workload in the winter? Most reputable swimming pool companies generally sell enough pool projects in the spring / summer months to carry-over into the winter months, generally allowing for new business to begin occurring in the spring of the next year. Refurbishing of existing pools also takes place in the off season months as well. So next time you see advertisements regarding "off season" specials, you might want to do your diligence and look at competitive proposals and obtain comparative analysis of your proposed project. 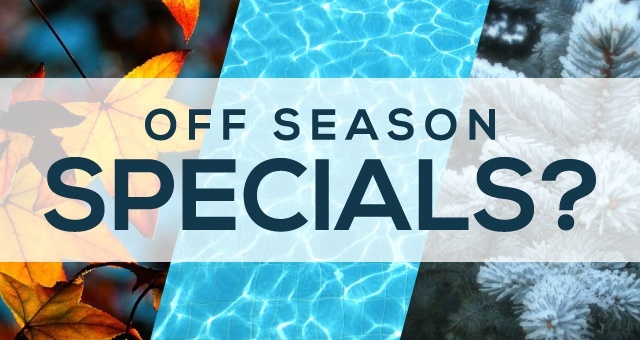 If you have an interest this fall or winter in seeing what Parrot Bay Pools can do for you click here to request more information or call us at (501) 664-6861. Looking forward to the cooler weather. A swimming pool with clear sparkling water on a sunny summer day can create a breathtaking focal point in any yard. Couple that with dancing water from fountains or deck jets and a custom swimming pool design that complements your home and yard, and you have a visual and auditory oasis, the perfect place to relax and check out of the stress and busyness of your day-to-day. But as the sun starts to set, will your oasis fade with it, or will it become a more dramatic and exciting night time escape? Night time opens up a whole new array of design possibilities for your backyard. Your pool can disappear into the darkness or come alive with lights, color, and fire. Adding types of lighting is a great way to get more use out of your swimming pool. One of the most common ways to bring your pool project to life at night is with in-pool lighting. There are two main types of lighting available. Incandescent is the most basic type. This is a somewhat antiquated lighting option. The main drawback with this type of lighting is the color limitations. In order to change the color of an incandescent pool light you have to place a colored filter over the light inside the pool. The bulb life is relatively short compared to the other options as well. If you are just wanting a basic and affordable way to light up your pool, this may be a good option. If you are wanting something with more capabilities, you should turn your attention to LED. The most popular modern lighting option on the market is LEDs, which stands for light emitting diodes. These bulbs don't emit any heat, they change colors and have several light show settings, and they have a very long life span compared to incandescent bulbs. The trade off is that the bulbs are more expensive. LED pool lights are the only option that offers vibrant lights with complete customization of color. When deciding how to light your swimming pool you should ask your pool designer about initial cost, bulb replacement cost, and ease of maintenance. In addition to the information here, these factors can help you determine which swimming pool lighting option is best for you. Bringing your pool to life at night starts with pool lighting, but it doesn't have to stop there. Other ways to create a dramatic night time environment are to add outdoor lighting that highlights patios and walkways, landscaping, and structures such as your house, pool house, or swim up bar and kitchen. If you are wanting to add and extra dramatic touch, building fire bowls into your pool design is an excellent way to do that. Fire bowls come in a wide array of styles and materials that will match any environment. These are a great way to create a warm, exciting ambiance around your pool. If you're on a budget less expensive options like lanterns, strings of lights, candles, and torches can be used to enhance your outdoor environment as well. Pinterest is a great resource for do it yourself lighting ideas. Your pool designer should discuss with you options for lighting and the difference betweend them. 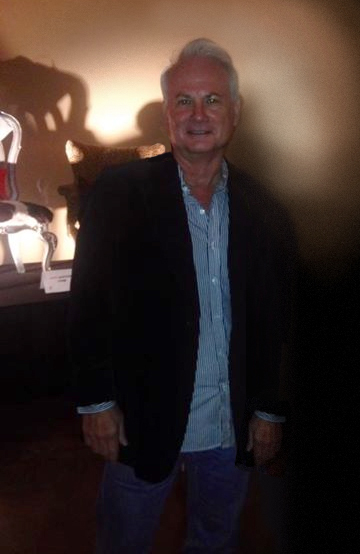 Call us today at (501) 664-6861 if you should have any questions about lighting. Don't make the mistake of placing the wrong lights in your pool. 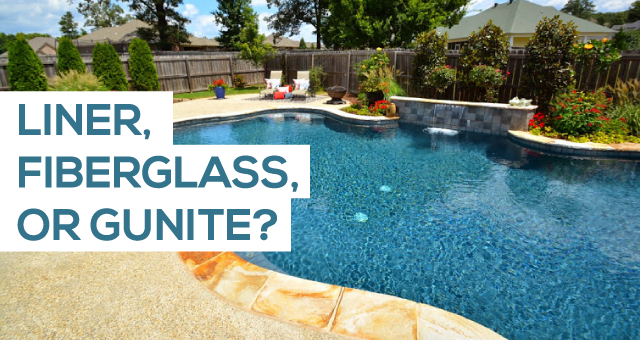 Liner, Fiberglass, or Gunite Pool...Which Type is Right for You? Planning your dream backyard can be a fun and exciting process. 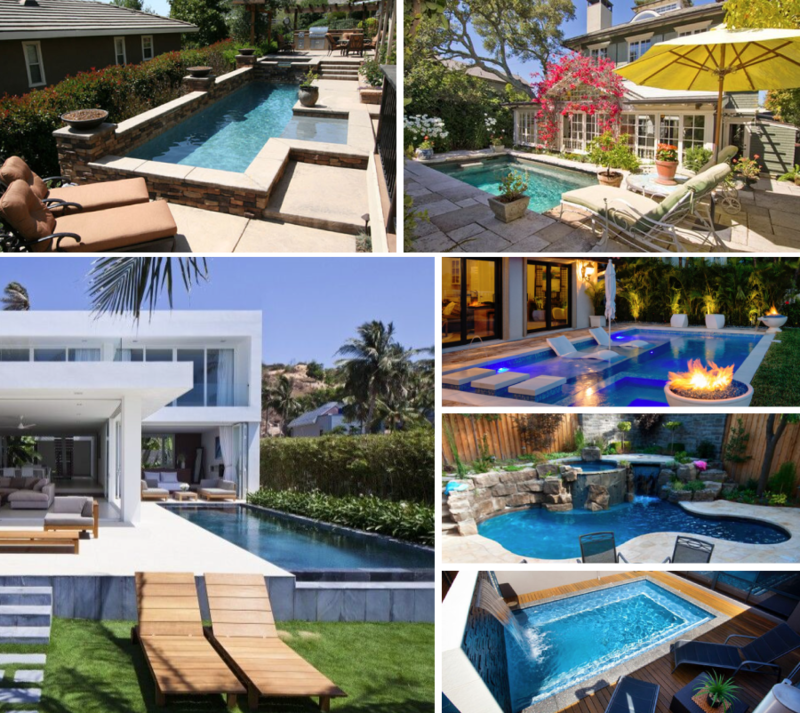 Before you can get down to details though, you have to decide which type of pool is going to work within your budget, best accommodate your lifestyle, and allow you achieve your ideal design. There are three main types of swimming pools: vinyl liner, fiberglass, and gunite/concrete. How do you know which one is right for you? If the price difference is a non-issue, there are other factors that can help you determine which is best for you. Another important factor is the degree of customization, especially if your yard is small, severely sloped, or has existing structures that will need to be built around. Liner and Fiberglass pools are more limited in size and shape. A liner pool can technically be many sizes and shapes, but it is most common for them to be simple cookie cutter shapes. They rarely have any built-in features other than steps. A fiberglass pool can have some built-in features, but they are limited in size because the pool shell has to be transported to the installation site and most shapes are predetermined based on what the factory makes. Gunite pools are the only truly customizable option that offers an extensive amount of built-in features such as fountains and waterfalls, attached spas, ledges and seating, swim-up bars and tables, and infinity edges. There are almost limitless options that can be included in a gunite swimming pool design, and they can be tailored to accommodate almost any yard. Here are some examples. So what's right for you? If keeping a costs low is your primary concern, vinyl lined pools are best for working within a lower budget. If construction time is a priority and customization is not as important to you, fiberglass pools can be installed and up and running in a shorter amount of time. 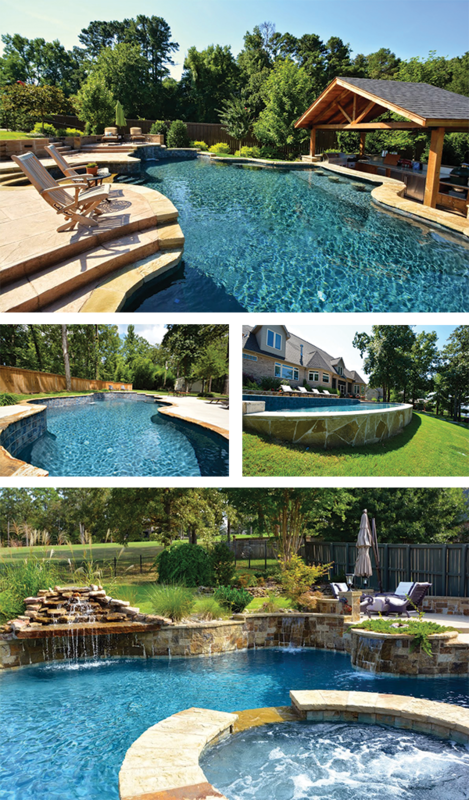 If you are looking for a luxury swimming pool that is unique and has unlimited potential for built-in features and customization, gunite is going to be the ideal option for you. If you still are not sure what type of pool is right for you or would like to look into what kind of financing is available, call and talk with our experienced staff today (501.664.6861) and they can help guide you in the right direction. Now that the rain has finally let up, we are back working dilligently to get caught up on our schedule. The rain and wet grounds have placed us some two months behind normal schedule. Ugghhh. If you are planning a pool project this year, with the HOT weather just around the corner, you might want to consider some type of water fearture. I have expanded on the types below to provide you with some information that may be helpful in your want list. Water features are a great addition to any in-ground swimming pool design. Not only do they add beauty to the pool and create sparkling moving water throughout the pool, the soothing sound of moving water can also make your outdoor environment more relaxing. There are many different types of water features to choose from. Certain types my be recommended by your pool builder to match the style of your swimming pool design. 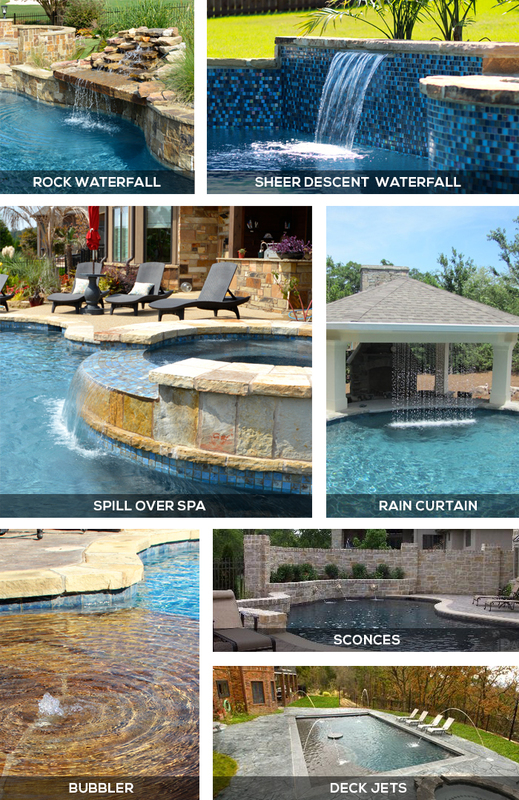 Here are some of the most common water features available. Rock Waterfalls are often paired with natural (organic) pool designs. They are a very common choice and often constructed out of different different types of natural rocks. Rock waterfalls vary in size and can be tailored to fit any size space. The water flow is very natural and uninhibited. Sheer Descent waterfalls create an arc of water that projects away from the pool wall. These are often coupled with modern swimming pools. They create a thin uniform glass like sheet of water coming out of a narrow opening. The opening can vary in length from about eight inches to eight feet. Rain Curtains are also typically paired with modern pools, and much like it sounds it creates a sheet of rain. Some rain curtains are places in stand alone structures, almost like a frame. Other curtains fall from the side of a structure like a pergola or awning that overlaps the pool. Spillover Spas are not necessarily a water feature, but they create a similar effect. There is usually a lower groove in the spa edge that allows the water to spill over in to the pool. These are seen in all types of pool. Some spill over directly into the pool and others trickle down stones or tiles more like a natural waterfall. Bubblers are usually seen in shallow areas of the pool like tanning ledges. The are a small jet in the floor of the deck that creates a stream of water that bubbles up. The height of the stream of water can vary. These are also seen in all types of pools. Deck Jets are strong glass like streams of water that come out of the decking surrounding the pool and land in the water. They are typically seen in modern pool designs because of their sleek uniform look, but they can be used in any type of design. These jets, often called Laiminars, can be illuminated by LED lights at night. Sconces are thin streams of water that come out of decorative elements on the pool wall. They are usually ornate pieces, different types of animals are also common. These are typically seen in geometric swimming pools and give them a more ornate and traditional look. If you have any questions about water features, or are ready to start planning your pool project, give us a call at your convenience at 501.664.6861. As 2015 heats up, (if it ever stops raining) the trend of turning plain yards into backyard retreats will continue to increase. It is becoming more and more common not to just build a pool, but to transform your entire yard. The trend is to create a cohesive space where you can relax, entertain, or spend quality family time. There are unlimited possibilities and at Parrot Bay Pools, we plan every detail of your space around you and how you envision living in it. There are, however, two major overall backyard trends that continue to be popular: Natural and Modern. Natural swimming pools, as we’ve talked about in our article on pool shapes, are pools that are typically freeform shapes. There are endless options when it comes to their shape. They are particularly perfect for small backyards, sloped yards, and yards that have existing structures that need to be worked around. Creating a Natural backyard does not stop at the pool shape. It extends to the pool finish, the coping, any special tiles that are used along the waterline or other areas of the pool, the patio decking, the water features, the landscaping and even the outdoor furniture. If you want a truly Natural look you may choose a more Natural finish color, like one that will give the pool water a more "aqua" color than a sky blue. Natural stone is commonly used for decking and coping to further create an earth-like setting. Rock waterfalls can be custom designed to accent your pool and they blend perfectly with this type of Natural environment. Finally, when selecting furniture for a Natural backyard, look for pieces with curves that will blend well with the organic space. Warm colors, earth tones, and Natural materials all compliment these types of spaces well. Instead of the organic freeform shapes that accompany a natural backyard, clean edges and stark lines are what form most Modern swimming pools. This style of pools are usually geometric shapes like we’ve mentioned in our article on pool shapes. They can be a simple rectangle, or a combination or various geometric shapes. Some of these pools may have one curved edge, but the majority of the will have clean lines. You can make these Modern looking pools even more stunning by adding an infinity edge with makes the water appear even with the top of the pool. These are particularly beautiful facing out towards stunning scenery. Instead of natural stone, these Modern pools incorporate glass tiles, travertine coping and often smooth uniform decking. Instead of earthy tones, these settings usually incorporate monochromatic tones and cooler colors that form the outdoor "color palette." Sheer descent waterfalls are commonly used in Modern settings. These create a smooth sheet of water that looks more uniform than a rock waterfall. Rain curtains also complement this type of pool. Simple yet sophisticated accents and furniture can be found to complete a Modern style backyard. Many backyard settings these days include much more than just a pool. There are several features large and small that can make your backyard warm and inviting. 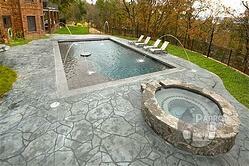 Water features have become a very common addition to most custom pools. Like everything else they range from simple to extravagant and there are various types. No matter what type of pool you chose even a simple water feature can help create an even more relaxing environment. Some common options are rock waterfalls, sheer descent (sheet) waterfalls, laminar and deck jets, bubblers, and rain curtains. Fire features have been steadily increasing in this Arkansas pool building market. Adding a fireplace or fire-pit can give you a new way to enjoy your backyard space in cooler evenings and seasons. There are choices that range from Modern and Natural to clean and sophisticated. Adding fire features to your pool, like fire bowls, can create a dramatic and inviting ambience after dark. Fire is one way to bring light to your backyard after dark, but the most common way is with LED lighting. They can be used to highlight your swimming pool, landscaping or both. Most LED options can be controlled easily with a remote control or your smart phone. Outdoor kitchens are another backyard option that has gained popularity over the past couple of years. Once you’ve completed your backyard oasis you’ll want to spend as much time there as possible. With an outdoor kitchen you can enjoy more time outside. This also keeps the party outside instead of inside your house. They create a great new way to entertain guests. Read about some of the different options you can include in our blog article on the things you must know about planning an outdoor kitchen. Patio Decking can set the tone for the entire space and should compliment the style of your pool. If you have existing decking, you can stain or over-lay with new concrete to match the new pool patio. Like with most other features, there is a large selection of options to choose from. You can read about them in our blog article on choosing your swimming pool decking. At Parrot Bay Pools, we can help you with your ideas regarding these options and design / create a project plan with a Modern or Natural style look that will compliment your home and move in synergy with the backyard spaces. Think about how this will all work out before you decide to just place a "blue hole" in the middle of your backyard. Proper planning is paramount when it comes to designing your spaces for your in-ground pool project. Contact us when you are ready to exchange your ideas, and we will share ours with you. 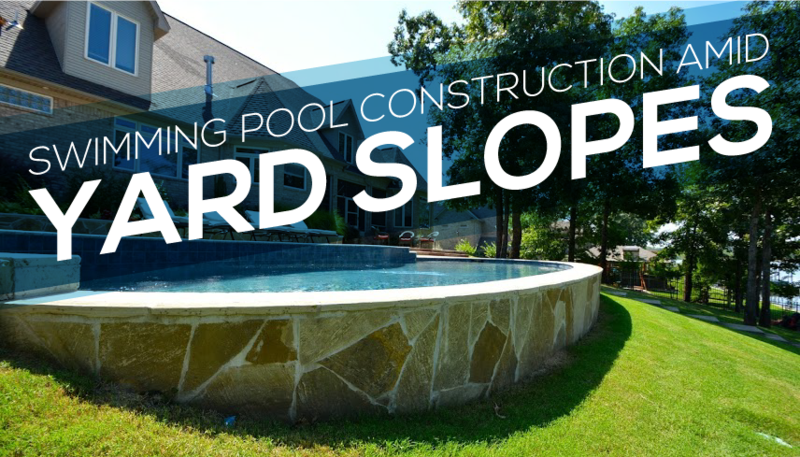 Sloped Yards are a common issue for swimming pool builders in Arkansas. In fact, if you call a pool builder and ask for a yard consult one of the first questions they ask will probably be about the slope of your yard. A slope in no way prevents you from being able to construct a pool, but it may affect your backyard design. Here are a few of the methods we use when designing / constructing a pool in a sloped yard. 1. Retaining Walls - Retaining walls are commonly used in construction to deal with slopes. A contractor may use them to level out a place between a house and the property line so they can create a level drive way. Or, they may be used to contain raised flower beds. They are not specific to pool builders or swimming pool construction, but they are something that we utilize. If a yard has a steep slope, a retaining wall can be used to separate the higher level form the lower level at one point in the yard instead of a gradual descent over a large area. 2. Building up the Downhill Side - Another option with sloped yards is to build up the down hill or low side. This simply means adding fill to the lower side to create a level area. This can lead to problems if it isn't done right. The fill that is added has to be properly compacted or it can lead to cracking later on when it finally settles. A compaction test to "Standard Proctor" of 95% is recommended. 3. 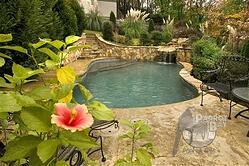 Constructing a Pool to fit the Yard - The third option is to create a pool layout that accommodates the slope. This can be done by building the gunite pool walls up on the high end of the slope to achieve a built-in retaining wall. Or, the pool wall on the low end of the slope can be built up so that the level of the walls is even all the way around the pool. The exposed pool walls can be tiled, or faced with stone to add to the aesthetics of the pool. The type of pool you decide to build, vinyl, fiberglass or gunite, will also affect the overall design and shape, not to metion, the flow of the pool (water) space. Below are some examples of gunite pools that we have constructed in sloped yards. You will want your poolscape to flow with the natural grade of your yard. Depending on your family and environmental requirements, the pool should have a "natural" flow to the landscape and not look like it was "backed in" by your designer / builder. This, by in large, will depend on the "type" of pool you build.